Have you seen Coco - the latest pattern release from Tilly and the Buttons? It's Tilly's third pattern but the first that's available printed and I was lucky enough to be a pattern tester, wahay! Let's talk about Coco. Coco is a Breton-style top or dress, designed especially for knit fabrics with lots of style options. Top or dress? Three quarter length sleeves or full length? Traditional slashed neck or sixties style funnel neck? Oh the decisions. 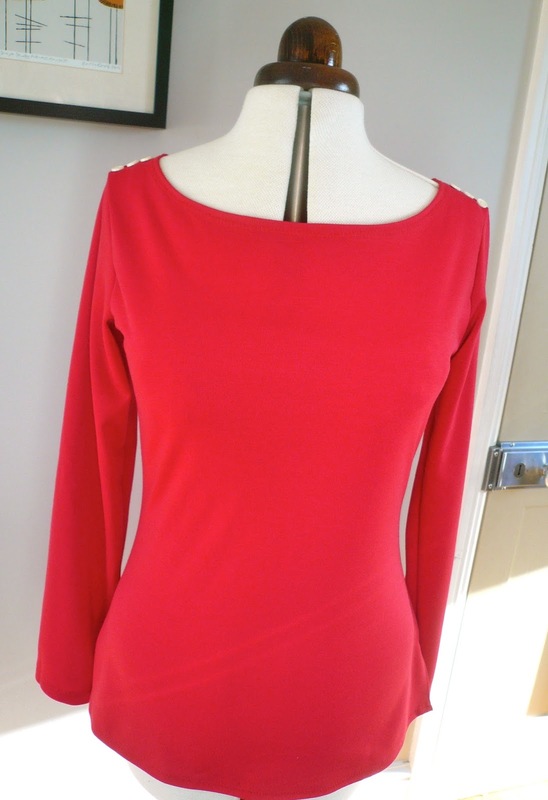 To test it, I decided to go for a plain necked top with full length sleeves. The pattern is intended for stable knits fabrics such as double knit, interlock knit or ponte knit. I chose a red double knit from an eBay seller which is a nice quality, but a bit on the raspberry side of red for my liking. Despite this, it sews up perfectly and washes well. Yes, it's been washed many times already because it's hardly ever off my back. The pattern is sized from 1 to 8, for reference I'm generally a UK10-12 for tops and I made a size 3. It's very flattering and comfortable and a great fit - I didn't have to make any changes to the pattern at all. The fit around the waist and hips does a great job of accentuating your shape whilst still being comfortable enough to do a bit of hoola hooping in, if you so wish. The top version of Coco only has three pattern pieces and it was super simple to put together. The sleeves are constructed flat i.e. the sleeve head is attached to the underarm whilst it's flat, then sewn up the side seams and arm seams in one go. Easy! I sewed the main seams on my overlocker and used a double needle for the hems and a zigzag stitch for the neckline, so no fiddling with neckbands. Don't worry if you don't have an overlocker, you'll be able to whip this up on a regular machine in no time. The weight of my double knit is quite thick and the top actually looks much better untucked. The side splits give it that ohh la la French look, especially when worn with unseasonal cropped jeans and wedges. I know, I know, it's freezing outside but I couldn't resist ('why are you wearing shorts?' my son asked me...) Tilly gives plenty of suggestions for adding your own individual touches to Coco. Naturally, I chose to add a row of nautical buttons to the shoulders, just because. And finally, we come to the packaging and instructions. In a word (or a few words), the packaging is to die for. I'm easily won over by packaging and the design on the front has polka dots as a background for goodness sake, what's not to like?! The instructions are clear as a bell and come in a full colour instruction booklet with step by step photographs!! Yes, really! 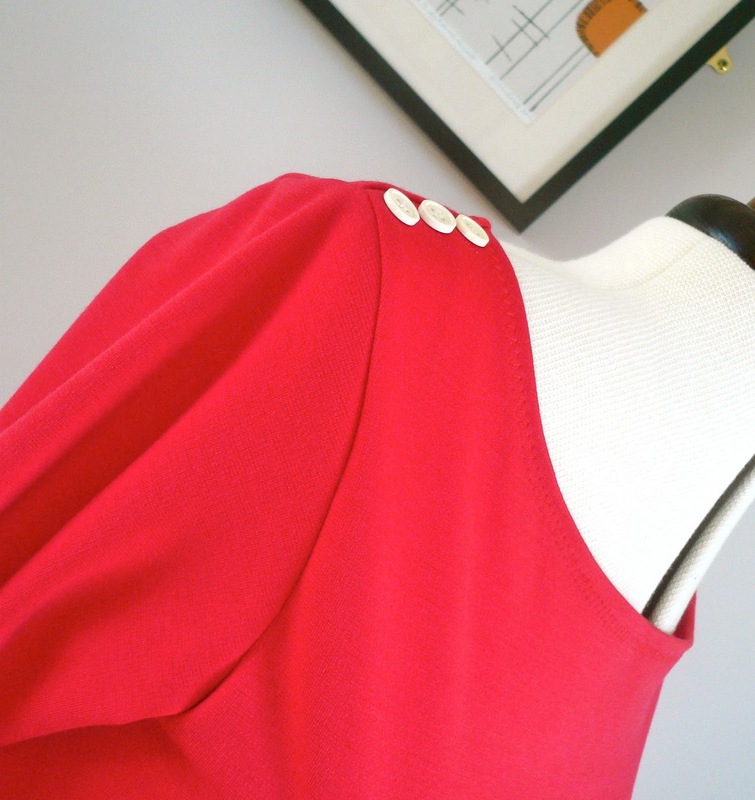 And if you still get stuck, Tilly has blog posts a-plenty on sewing with knits etc scheduled over the next few weeks. I think the Coco pattern is a really important new kid on the block. It's an excellent introductory pattern for newbie sewists and a well drafted, well fitting pattern for those with a bit more experience under their belts. Congratulations Tilly, I know that an incredible amount of hard work has gone into creating this pattern - and it shows. Coco deserves to do well and I'm sure it will. If you haven't yet bought a copy, you can get one here. The Coco pattern was given to me free of charge for pattern testing. All views my own. Your top is gorgeous! I LOVE the buttons on the shoulders, what a great idea. I shall look forward to seeing your dress version. I got the pattern in the post yesterday (only ordered it the day before! ), and can't wait to try it out. I am determined to conquer my fear of knits!! It definitely looks like a wardrobe staple. I love the color and th buttons. I can't wait to see the dress. Hi Jane -- I'm a beginner sewist and am enjoying following your blog. Your projects really inspire me but I'm still intimidated to consider dressmaking for myself! I'll get there though! My next project is to learn to sew with knits (looking forward to Tilly's upcoming tutorials). Your Coco looks great! Did you use a regular sewing machine or a serger? I notice the top-stitching looks like a zigzag. I have a sewing machine that has a couple of stretch-stitches and accommodates a twin needle. I'm just researching my different options and was curious about your process. Oh my gosh, this looks great! I saw your dress version on Twitter, but I'm loving this red top! Bravo! I think this shade of red looks great on you! Not too berry at all, IMO. Oh it's fab Jane...love the button detail! And I love how you're building up to your dress, which I must admit, is also rather fab! Way cute! Love the buttons! stunning - I will definitely be trying this pattern! I am loving the pics of the instructions I've seen for the pattern. They look so easy to follow and understand, at least for me, since I'm a visual learner. The top looks great! I have to now go look up the difference between interlock knit and double knit. I have some ponte knit, already. Such a lovely top Jane, the buttons on the shoulder are a nice details. Can't wait to see your dress verison. I'm currently waiting for my Coco pattern to arrive in the post, the joys of living in Finland. It looks like a great top! The buttons are very cute and I like the more fitted sleeves - very cute!! Lovely top. I like the buttons on the shoulder seams. Coco's a great pattern, it's rare that you want to make every style from a pattern and many times over. Gorgeous! I'm planning a Coco dress in a lovely stripey blue and navy double knit. Knit + stripes = yum yum! You convinced me Jane! I am waiting for my copy to come in the mail. I ready to explore the world of knits. The Great British Sewing Bee needs YOU! © 2013 Handmade Jane. Made with ♥ by Pish & Posh Designs.